I am guilty of many things in life – one of which has been, until recently, neglecting my sourdough starter with varying degrees of severity. I mean, if wild yeast abuse was an actual thing, hoo-boy would I be in trouble! Sure, there were weeks at a time when Chad (my starter) would be happy, healthy, and well-fed. Unfortunately, equally frequent were the spurts when I just didn’t have time to make or think about bread, and Chad (as we like to call him) would become lost to the oblivion that is the back of our fridge. When I did eventually rediscover his existence, I would find him in a sad state indeed: slumped, sour, and malnourished. I would then nurse him back from the clutches of death – only to repeat this rather demented cycle a short time later. Now, it’s not like I’m a bad person. This wasn’t intentional torture, it’s just that sometimes Chad just didn’t make it onto my priority list – life, amirite? Well, let me tell you – these sourdough waffles have changed all that! 1. In a sauce pot, combine all ingredients, except tomatillos, and bring to a boil. 2. 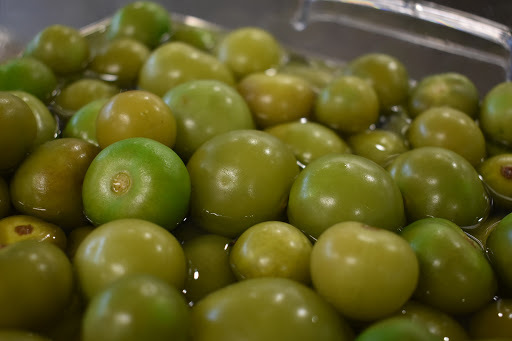 Carefully pour hot liquid over tomatillos in sterile jars. 4. Place the jars in the pot of water – water should be one inch below the top of the jars. Bring the water to a boil, once the water reaches a full rolling boil, boil the jars for 10-15 minutes. 5. Turn off the heat and remove jars with lifters or tongs. It was Megan’s birthday a couple of days ago, and everyone was expecting me to cook a multi-course meal, do some kind of binge-eating, or travel downtown for a fine-dining experience (ending with a visit to Roselle for desserts, obviously!). But these days, Megan and I really enjoy a good night in: trying a new recipe or an old faithful, opening a bottle of wine and relaxing in our PJs.